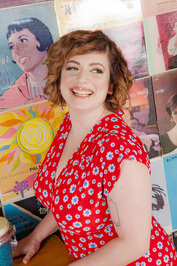 Sara Benincasa is a comedian and author of the books "Real Artists Have Day Jobs" (William Morrow 2016); "DC Trip" (Adaptive Books 2015); "Great" (2014); and "Agorafabulous! : Dispatches From My Bedroom" (William Morrow 2012), a book based on her critically acclaimed solo show about panic attacks and agoraphobia. She is currently adapting "DC Trip" as a film with producers Albert Berger and Ron Yerxa ("Little Miss Sunshine," "Nebraska," "Election"), Van Toffler, and Adaptive Studios. She is currently adapting "Agorafabulous" as a TV pilot with executive producers Diablo Cody ("Juno," "The United States of Tara"), ABC Studios, and Ben Stiller's Red Hour Television..
To ask Sara Benincasa questions, please sign up. Is this book based on life experiences or your imagination, and which do you prefer/find easier to use when writing? Sara Benincasa My mom just asked me that this morning! So thanks for being in sync with Lil. Well, the main character is a 23-year-old high school teacher - like I…moreMy mom just asked me that this morning! So thanks for being in sync with Lil. Well, the main character is a 23-year-old high school teacher - like I once was. She's woefully underprepared - like I once was. And she's a very idealistic hippie - like I once was. The three main teen characters are Gertie, an anxious kid (like I was); Rachel, a religious girl with a naughty streak (like I was); and Sivan, a queer kid who is passionate about social justice (like I was - I didn't know about the queer part then, but I would've gravitated to Sivan). They visit places I've visited as a teen and as an adult. Sara Benincasa The best thing about being a writer is building little and big worlds out of your own dreams. Also: wearing pajama pants all day. Checketry – the free download manager for gamers – announces that it is working on a feature that will allow users to convert video to an mp3 download. Sara Benincasa voted for Real Artists Have Day Jobs: (And Other Awesome Things They Don't Teach You in School) as Best Humor in the Semifinal Round of the 2016 Goodreads Choice Awards. We’d love your help. Let us know what’s wrong with this preview of Tim Kaine Is Your Nice Dad by Sara Benincasa. "Who needs years of research? This is the first book written about Tim Kaine this election season. While the pundits blathered and got toasted at the CNN Grille, Sara went to work getting to the heart of why we like Tim Kaine. "Sara's done it, y'all. She's written the Tim Kaine dadfic we so desperately needed. " We’d love your help. Let us know what’s wrong with this preview of Real Artists Have Day Jobs by Sara Benincasa. We’d love your help. Let us know what’s wrong with this preview of D.C. Trip by Sara Benincasa. We’d love your help. Let us know what’s wrong with this preview of Agorafabulous! by Sara Benincasa. Thanks for friending, you are awesome! Sara, thanks for the "friending." As a person who has suffered pretty much her whole life with panic and anxiety, I loved your book. I am amazed at all you were able to accomplish. Looking forward to your new books.